Is it possible to make tasty Tuscan-inspired nibbles for five with a single plum tomato? It's not only possible; it's quite easy! 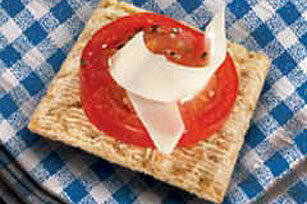 Top each cracker with tomato slice. Sprinkle evenly with the cheese and pepper. Store ripe tomatoes, stem-sides down, at room temperature away from direct sunlight and use within a few days. Do not store tomatoes in the refrigerator or they will lose most of their flavor.